.. the programming process in SolidCAM is much easier, faster and more effective, compared to the other CAM system..were very enthusiastic from the results of iMachining 3D. ..For the second side of part – it is only possible to fix the part by vacuum. With iMachining, the programmer could not believe that with vacuum fixation, we can cut the part at such high speed. Australian customer iMachining Success in Aluminum! 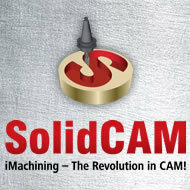 ..SolidCAM user can remove 7.7KG of material that they have never cut before in 17 minutes!........simply amazing! ..they were absolutely impressed with the iMachining 3D cutting and after 40 minutes (saving 56% in cycle time) we finished the first side. Amazing testimonial from an iMachining 2D & 3D happy customer in Germany! ...The metal removal rates – Gigantic! Programming – super easy, super fast! Tool life - Awesome! Everything is exactly like SolidCAM have said! And it was just unbelievable.. Huge aluminum part cut with SolidCAM, mainly with iMachining.. Cutting part with iMachining 3D saves cycle time and extends tool life dramatically! ....33% saving in cycle time..ISCAR Tool cut 12 Parts with iMachining 3D toolpath, instead of only 1 Part with Competitor CAM! Nate Stuart, 034motorsports: "Absolutely loving iMachining, or rather my operator is!" ...he's always impressed how quickly we're chewing new parts thanks to it - it's cut our steel times way down, and tool life is way up..the times are dramatically reduced..